MILWAUKEE — Some of the great moments in Milwaukee Brewers history occurred in the 1990s, the third decade in franchise history. But for all those moments, there were not many wins to go along with them, and even fewer winning seasons. After finishing second in the American League East and posting just the fifth 90-win season in club history in 1992, the rest of the decade did not go nearly as well for the Brewers. In fact, the Brewers did not have another winning season, or even a .500 record, through the rest of the 90s. This weekend, as a part of the 40th anniversary of the move from Seattle, the Brewers are celebrating and reflecting on the club’s third decade in Milwaukee. On Friday, the Brewers will wear reproductions of the club’s 1997-99 uniforms, featuring “BREWERS” in block letters on the front, while the cap features an “M” logo. On Sunday, all fans in attendance will receive a collectible bobble head doll featuring Hall of Famer and Brewers legend Robin Yount recording his 3,000th career hit on Sept. 9, 1992, a sharp single to right field at County Stadium. Despite a winning 1991 season, the Brewers introduced a new general manager, Sal Bando, and a new manager, three-time All-Star infielder Phil Garner, before the next season. Much like the club’s first year under previous manager Tom Trebelhorn in 1987, the Brewers’ 1992 season was among the best in club history. With just over a month remaining in the season, they put together one of the best offensive displays in club history. On August 28, the Brewers scored a franchise-record 22 runs, while setting an American League record with 31 hits in a 22-2 victory over the Toronto Blue Jays. But while that certainly was a memorable moment in one of the greatest seasons ever for the Brewers, three other aspects of the 1992 season stand out as the true highlights. One of those was 24-year-old rookie shortstop Pat Listach, whose arrival with the big league club came due to an injury to Bill Spiers. After spending the previous four seasons in the Minor Leagues, Listach was perhaps the biggest surprise of the season for the Crew. Listach batted .290 in his rookie season while driving in 47 runs and recording 54 stolen bases, becoming the first Brewers player to swipe more than 50 bases in a single season. That performance earned Listach the American League Rookie of the Year Award as well as a handful of votes for AL MVP in 1992. “Rookie of the Year. That’s a pretty good first season,” Yount said of Listach. “He was an exciting player. What I remember specifically about him was that he seemed to deliver a large amount of big hits that season, which is unusual for a rookie. As great as Listach’s individual season was, the Brewers as a whole put together their best campaign since the club’s AL-pennant-winning season of 1982. As the Brewers’ leadoff hitter, Listach led an offense that featured Yount in center field, B.J. Surhoff behind the plate, Greg Vaughn in left field and designated hitter Paul Molitor, playing his final season with the Brewers. Milwaukee finished 92-70 in Garner’s first year at the helm, good for the fourth-best record in franchise history. The Brewers ended the season four games out of first place in the AL East, behind the Toronto Blue Jays, who went on to win the World Series. Though they came up short in the end, the Brewers thrilled fans in the season’s final month, posting a 20-7 record in September. In the club’s home finale, the Brewers beat the Oakland A’s, 5-3, on Sept. 27, to complete the sweep and cut the Blue Jays’ lead to just 2 1/2 games with six games remaining in the regular season. “The players need to take a curtain call,” Garner told reporters that day after a standing-room-only crowd of nearly 55,000 gave the Brewers a standing ovation. “They could not have played more inspiring ball than they have the last five or six homestands. Of course, Yount had a handful of highlights of his own in the 1990s. Along with the pennant race and Listach’s impressive rookie campaign, the 1992 season was highlighted by Yount’s push for 3,000 career hits. The moment finally came in early September. With a seventh-inning single to right field off Cleveland pitcher Jose Mesa on Sept. 9, 1992, at County Stadium, Yount became the third-youngest member of the 3,000-hit club at 36 years, 11 months and 24 days old. 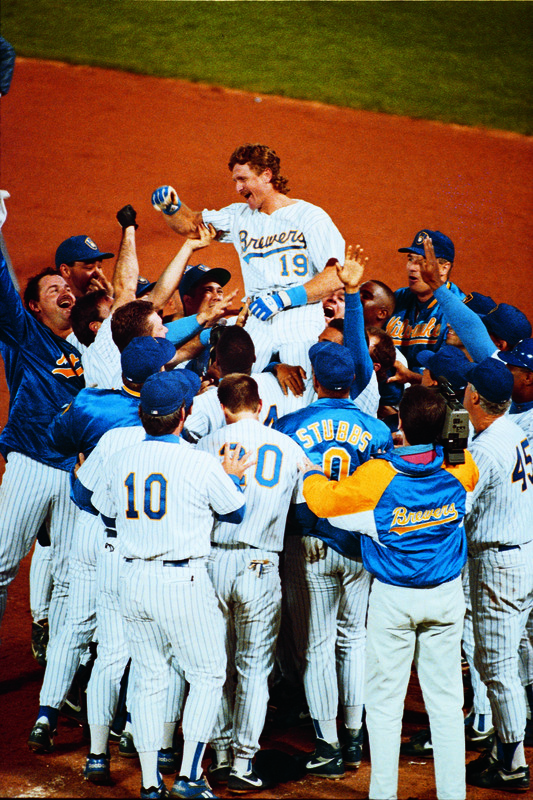 After collecting the hit, Yount was mobbed by teammates and lifted onto their shoulders in a celebration that lasted nearly 10 minutes. “Obviously it was an exciting moment,” Yount said. “But it was more about the pennant race than the 3,000th hit for me. It was September and every game meant something. Yount retired after the 1993 season with 3,142 career hits. A year later, on May 29, 1994, Yount had his No. 19 retired by the Brewers in a ceremony at County Stadium. As a part of the festivities, the Brewers and Harley Davidson gave Yount a new motorcycle, which he rode a lap on around the stadium, recalling memories of his famous ride following the 1982 World Series. Five years later, Yount was honored again, this time by the Baseball Writers Association of America. Included on 77.5 percent of ballots in 1999, Yount was a first-ballot Hall of Famer, the first player to ever enter Cooperstown wearing a Brewers cap. During his speech, Yount borrowed from Lou Gehrig’s famous farewell address. In the years between Yount’s retirement and his induction into the Hall of Fame, a number of changes were introduced by Major League Baseball. First, in 1994, the Central Divisions were added in the AL and NL. The Brewers, along with the White Sox, Twins, Indians and Royals, formed the AL Central Division. The Brewers would spend just four seasons in the AL Central, however. In 1998, the Tampa Bay Devil Rays and Arizona Diamondbacks joined the AL East and NL West, respectively. Their addition forced the move of one club from the American League to the National League, in order to preserve an even number of teams in each league. After the Royals opted not to switch leagues, the Brewers decided to make the move. “I think it’s a wonderful thing for baseball,” former home run king Hank Aaron said at the time. “It’s a great day for Milwaukee. Milwaukee’s first identification was with the National League. Thanks to a pair of home runs by Jeromy Burnitz, including a grand slam in the top of the 11th inning, the Brewers secured their first National League victory on April 2, 1998. Fittingly, they defeated the Atlanta Braves, 8-6, at Turner Field.